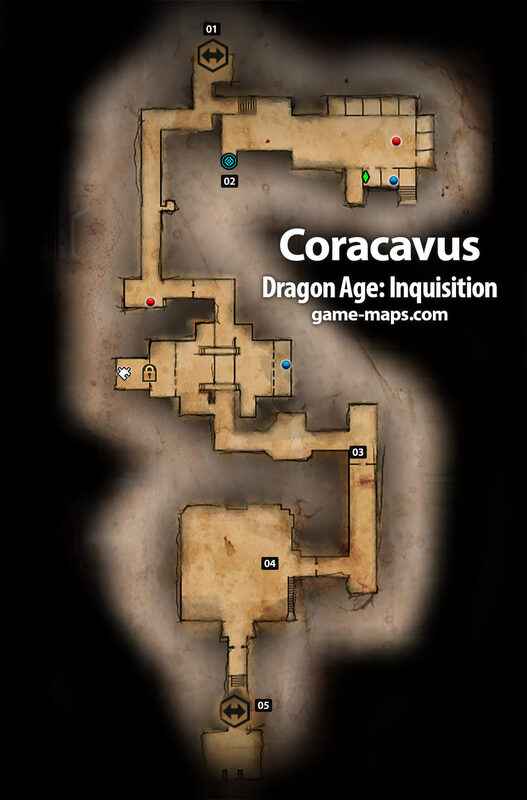 Coracavus Dungeon - Dragon Age: Inquisition Walkthrough, Game Guide and Maps, with Quest and Locations of Camps, Merchants, Rifts, Ocularums, Astrarium, Dungeon Entrences, Landmark (POIs), Crafting Station, Mosaic Piece, Inquisition Agent, Secrets, Party Members, Bottle of Thedas and Codex Entry. ON THE EDGE OF THE EMPIRE, THEY ERECTED A PRISON: CORACAVUS, THE DARK PIT. FAR REMOVED FROM THE CULTURAL HEART OF THE IMPERIUM, CORACAVUS HELD AND METED OUT PUNISHMENT TO LOCAL PEOPLES WHO DENIED TEVINTER'S CLAIMS TO THE REGION AND TO SO-CALLED "LOYAL" CITIZENS WHO BELIEVED LIVING ON THE FRINGES OF CIVILIZATION WOULD GRANT THEM IMMUNITY FROM THE IMPERIUM'S LAWS. IN A FEW CASES, POLITICAL PRISONERS WHO COULD NOT BE SENTENCED WITH EXECUTION WERE SENT TO CORACAVUS INSTEAD. IT WAS WIDELY KNOWN THAT BRIBES BOUGHT NOTHING THERE AND HAVING THE RIGHT NAME WOULD NOT BE REWARDED WITH LENIENCY. IT'S SAID THAT UPON HEARING THEIR JUDGMENTS, THESE INDIVIDUALS BEGGED FOR DEATH. This Dungeon let you open way to north-eastern part of Western Approach map. NPC: Giant you have to kill him.